Eventually I'd like to post to my blog everyday...I'm getting there - really I am! And I'd like Fridays to be my Frugal Friday - the day where I will dip into my bag of scraps and create a card using just what I find in there (embellishments don't count). Now, keep in mind that this also where I put my 1/2 sheets after I've cut a full sheet to make a card, so those count! 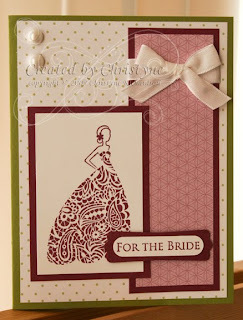 I stamped the bride from the "For the Bride" set (which unfortunately will be retiring come January 4th - SO sad!) in Rich Razzleberry on Whisper White. She was then adhered to a piece of Rich Razzleberry cardstock and set aside. The long panel is a piece of Cottage Wall DSP adhered to another piece of Rich Razzleberry Cardstock. The card base is Old Olive and the next layer up is also from the Cottage Wall collection of DSP. This is so pretty! Love the colors and retiring already??? Oh,my! great colors! I do like this set!